Looking for a “pick-me up” on an early spring afternoon? Tea and Chocolate pairing provides a warm caffeine boost, while also boosting your daily intake of flavenoids and antioxidants. It’s good for you, and, even better, it tastes so good! You’ll find a lot of obvious matches. For instance, Chai (generally a sweet tea with steamed milk) is often recommended with milk chocolate. And, citrus flavored teas pair well with citrus flavored chocolates. You’re also bound to find some teas you’ve never tried before pair well with your favorite chocolates. So, try them. And, don’t be limited by what others have already tried and recommended. We know what your favorite chocolates are! So, what’s your cup of tea? Experiment a little, and you’re bound to find some new pairings that work well for you. We have put together our own Trappistine Chocolate and Tea Pairings Guide to help you get off to a running start. You’ll find our Trappistine Chocolates are packaged in quantities that will support tea pairing parties, so plan a winter warm up with your friends! And, let us know what you discover so we can share it with your fellow tea enthusiasts! Feel free to e-mail your feedback about our pairing guide, and your own discoveries to: trappistinecandy8@gmail.com. Include a photo, and we’ll share them on Facebook. So, get to it! It’s time for a winter warm-up! And, don’t forget to share the warmth with us. 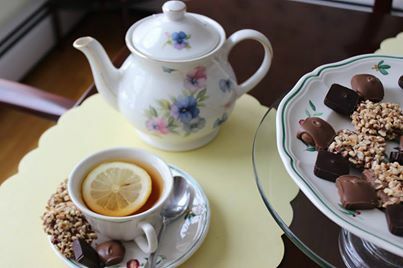 Watch for more on tea and chocolate pairings on Facebook and in our monthly newsletter. Previous Previous post: Spencer Trappist Ale and Trappistine Chocolates Pair Well!